A Soyuz rocket is readied for its cold weather launch from Baikonur Cosmodrome on Dec. 28, 2011 with the latest cluster of Globalstar second-generation spacecraft. Visible at left and right is the two-piece “frame” service tower system that will be raised from its current horizontal position into place around the launcher. A series of security breaches at a rocket factory in northern Moscow has Russian officials demanding change and promising to punish those who let the incursions happen, according to news reports. A group of Russian bloggers claim they got into the state-run Energomash plant, which manufactures motors for civilian and military rockets, five separate times over the past several months, the Reuters news agency reported today (Dec. 29). Blogger Lana Sator said she and her friends didn't encounter security guards on any of their night-time jaunts on the Energomash grounds, Reuters reported. Sator has posted nearly 100 photos taken during the outings at lana-sator.livejournal.com. Rogozin promised to punish the officials responsible for the factory's security, who he called "sleepy cats." He also issued a warning to the "cheeky mice" bloggers, or anyone else thinking about pulling off a similar caper. "I don’t advise anybody to penetrate strategic installations anymore," Rogozin said, according to Ria Novosti. The breaches are just the latest embarassment for the beleaguered Russian space program, which has had a pretty bad year. On Feb. 1, for example, a Rockot launch vehicle failed to deliver an Earth-observing satellite to the proper orbit. A Proton rocket similarly underperformed on Aug. 18, failing to place a $300 million communications satellite in the desired orbit. Less than a week later, on Aug. 24, the unmanned Progress 44 supply ship crashed while hauling cargo to the International Space Station, doomed by a problem with the third stage of its Soyuz rocket. Russia uses a similar version of the Soyuz to launch astronauts to the space station, so manned flights were put on hold until the problem with the rocket could be identified and fixed. Then the $165 million Mars moon probe Phobos-Grunt got stuck in Earth orbit shortly after its Nov. 8 launch. The spacecraft's thrusters were supposed to fire to send it on a course for the Red Planet, but they never did so. Most experts say Phobos-Grunt is a lost cause, and they expect it to come crashing back to Earth in mid-January. 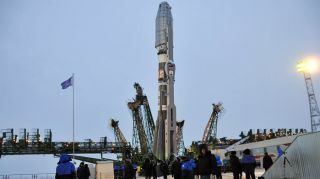 Finally, a Soyuz-2 rocket crashed just after liftoff on Dec. 23, destroying a Russian military communications satellite.